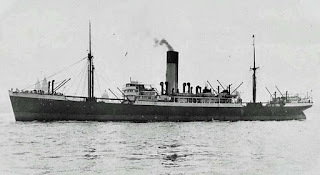 Now that the fact the vessel SS Eumanes NEVER existed, I began to ponder about the credibility of our numismatic publications and was wondering why none of the Malayan banknote gurus or senior dealers do not bother to do research in substantiating the truth about the Malayan 1940 $1 & $5 and their associations to these so called vessels, SS Eumanes & SS Automedon. 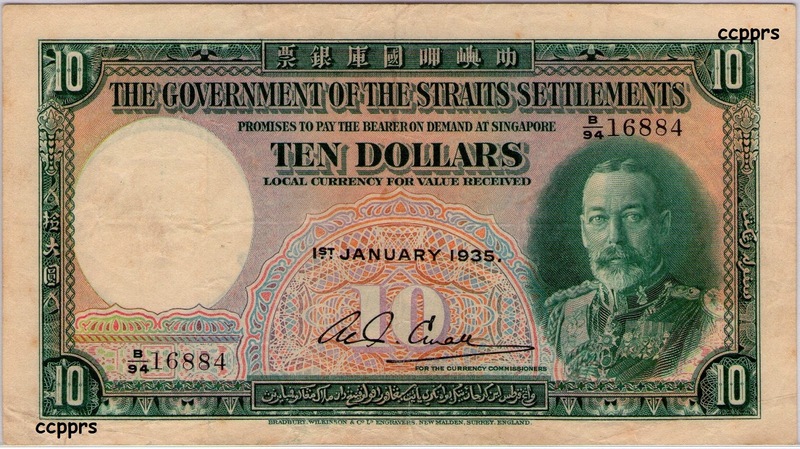 So with the help and encouragement of one learned and dedicated Malaysian numismatist, Gilbert Chang, who prompted me to do some research on this article. 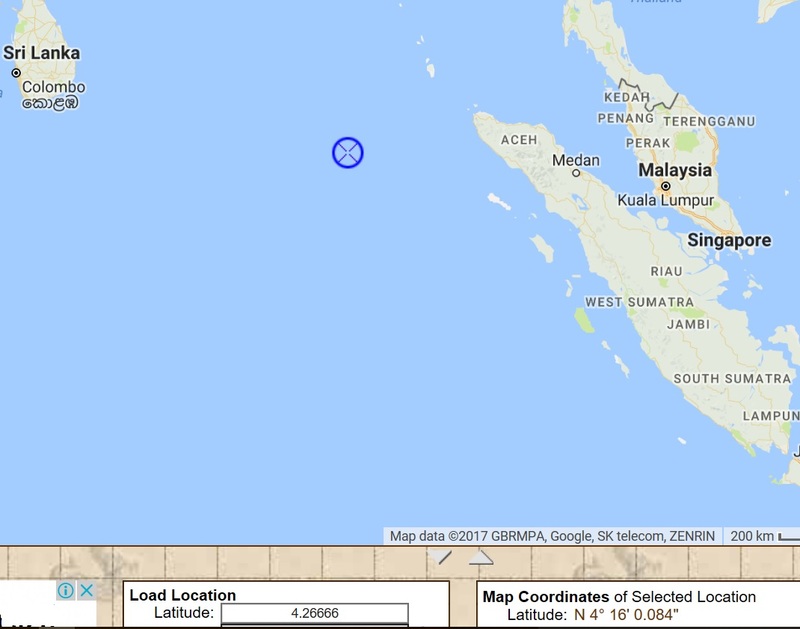 According to certain publications and hearsays from this region about 700,000pcs $1 and 500,000pcs $5 was supposed to be onboard the SS Automedon, which sank near the north western tip of Sumatra and that some banknotes happened to drift into the Straits of Malacca and found their way into the hands of some locals. Well, the events that led to the sinking of SS Automedon has been well documented and publicised in many war journals and books outside of this region and in all of their articles, NOTHING was ever mentioned about she carrying Malayan banknotes! On September 24, 1940 the 7,528 tons Blue Funnel Line merchant vessel ‘SS Automedon’ of the A & R Holt Shipping Line prepared to leave Liverpool on a routine voyage to Singapore, Hong Kong and Shanghai. On board was a general cargo consisting of crated aircraft, machinery, vehicles, foodstuffs, Mrs Ferguson's tea-set and 120 mail bags, including the latest merchant navy code deciphering tables 7,8 and 9. In addition to this was a slender green bag, placed aboard on the orders of Air Chief Marshall, Sir Cyril Newall of the Chiefs of Staff. 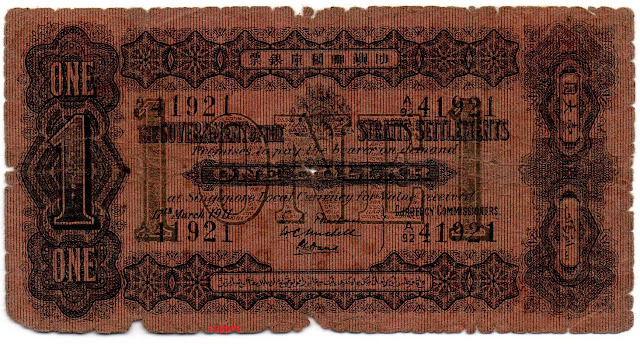 Inside of which was a full copy of the August 1940 COS Far Eastern Appreciation. This was destined for the attention of the CinC Far East, Air Chief Marshall Sir Robert Brooke Popham. Precisely why a copy of this report was sent to the colony in such an insecure manner is a question that, in all probability, will never receive a satisfactory explanation. Though whilst offering consideration to this point, another issue warrants far deeper consideration. This being, why was an Appreciation dealing mainly with the defence of Singapore and Malaya despatched to its Commanders at such a late date, particularly as the document had now been in restricted circulation for more than a month? The most feasible theory attached to this deliberate action concerns itself with the British War Cabinet and their possible desire to ensure the entire Appreciation could not be discussed at the Singapore Defence Conference of October 1940. Particularly as documented evidence alludes to the War Cabinet having deep reservations that any pessimistic disclosures within the Appreciation could prelude a detrimental reaction on recent requests to Australia and New Zealand for reinforcements to be sent to the Middle East and Fiji. If we accept this theory to be an indicative of events; with the War Cabinet having successfully denied the full details of the Appreciation from their colonial allies and in direct contrast, perhaps they deemed it as beneficial in future dealings with the Dutch to discuss the Chiefs of Staff Appreciation in its entirety at the forthcoming Anglo-Dutch Staff Talks of November 26-29. A meeting at which the Dominions were not represented, though an American observer was allowed to attend. Furthermore, and in support such speculation, barring unforeseen circumstances, the full Appreciation would have arrived at the colony a number of days before onset of these talks. 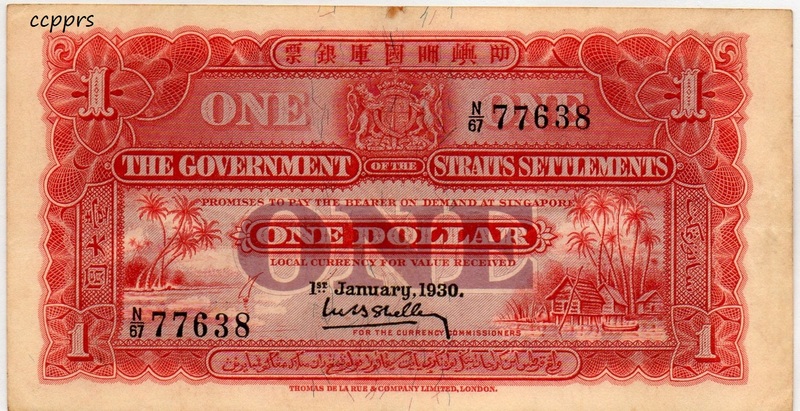 This appears consistent with the ‘Most Secret’ document being on board Automedon; especially as the Governor of Singapore, Shenton Thomas left Britain for the colony before Automedon set sail, commencing his journey by seaplane prior to Japan signing the Tri-Partite Agreement. However he never reached Singapore until December 5, some three weeks after the ‘Blue Funneller’ was set to arrive…and obviously too late for the Appreciation to be available for deliberation at the Anglo-Dutch Talks. Even so…it cannot be questioned that Thomas’s mode of transport was a far safer method for such sensitive documentation, particularly when the waters of the Indian Ocean, in which Automedon would be travelling were known to be infested by German Raiders (armed merchant ships). Though without question, the greatest mystery of all surrounds the newly appointed CinC Far East Brooke Popham who departed Britain to take up his post on October 27, arriving at Singapore a few days before Automedon was due for docking. Surely it made more sense to allow Popham to carry a copy of the Appreciation with him, particularly as he was never privy to its full contents prior to leaving Britain. Subsequently, to have a copy in his possession on a journey of more than two weeks would have served two purposes. In the first instance it would have offered the CinC precious time to conduct a full evaluation of the Appreciation’s findings whilst enroute to the colony. Secondly, with Brooke Popham due to Chair an important conference within days of his arrival, prior knowledge of the reports contents would have enabled him to discuss any contentious issues with his Local Commanders before onset of talks with the Dutch? Unfortunately for Automedon her fate had now been sealed, as this intercepted distress call preceded the capturing of Ole Jacob by an infamous German Raider. In a matter of hours Automedon would be their next victim. 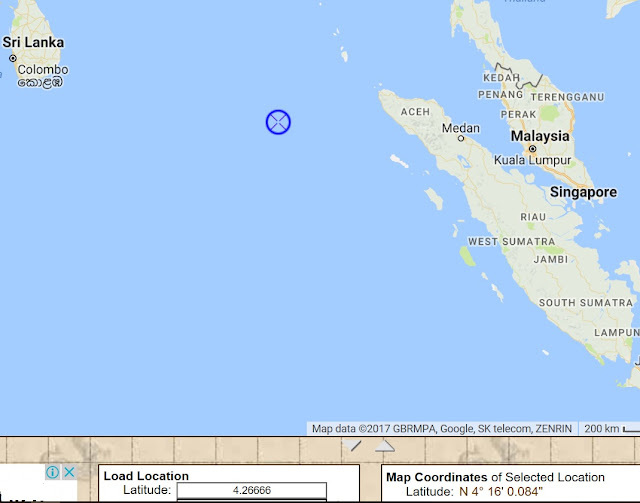 The remainder of the night passed without disturbance and as first light broke on November 11 the ‘Blue Funneller’ was some 250 miles off the north western tip of Sumatra, her Second Mate, Mr Stewart was on watch. Gradually the outline of a ship came into view, approximately three points off the port bow. Stewart responded by calling Captain Ewan to the bridge, after much deliberation they surmised the vessel to be of Dutch origin. Regrettably, this was a fatal error of judgement. With Automedon at 2,000yds the raider responded by pouring salvo after deadly salvo into the merchantman, quickly destroying her emergency dynamo house and causing horrendous damage throughout the ship, seconds later the Germans jammed the distress call. And after just three minutes of chaos the one-sided action was over as the Raider ceased fire. Though such was the accuracy of her gunnery, Automedon was now a listing hulk with six of her crew dead and 12 injured. Understandably, the scene onboard was appalling with the bridge and accommodation quarters in a shambles and all the life-boats destroyed. Although the ‘RRR’ was brief and incomplete (the wireless operator being unable to offer a longitude reading before the radio mast was destroyed) it had nevertheless been intercepted by the British merchant ship SS Helenus, which ironically belonged to the Holt shipping line. The Master of Helenus (P.W. Savery) responded by forwarding details of the incident onto Colombo, though because of ineptitude by wireless operators at the shore base, it took one and a half hours until acknowledgement of the message was received by Helenus . 'We got to work on the strong room, finding fifteen bags of secret mail, including one hundredweight of decoding tables, Fleet orders, gunnery instructions, and (so-called) Naval Intelligence reports…..
Our prize was just a long narrow envelope enclosed in a green, bag equipped with brass eyelets to let water in to facilitate its sinking. The bag was marked ‘Highly Confidential…To be destroyed’ and the envelope addressed to The C.in C, Far East…To Be Opened Personally. The documents had been drawn up by no less an authority than the Planning Division of the War Cabinet and contained the latest appreciation of the Military strength of the Empire in the Far East. There were details of Royal Air Force Units; there were details of naval strength; there was an assessment of the role of Australia and New Zealand; and most piquant of all, a long paragraph regarding the possibility of Japan entering the war, a paragraph accompanied by copious notes on the fortifications of Singapore. What the devil were the British about, sending such material by a slow old tub like Automedon, I, puzzled? Surely a warship would have been a worthier repository? We could not understand it'. Mohr’s skipper, Captain Rogge, (who was fluent in English), soon realised the importance of this intelligence windfall, which also contained….new cipher tables for the fleet, information on minefields and swept channels, maps and charts and British Secret Service reports. As history would have it the important information was passed on to the Japanese High Command and she subsequently entered into the Second World War by bombing Pearl Harbour. 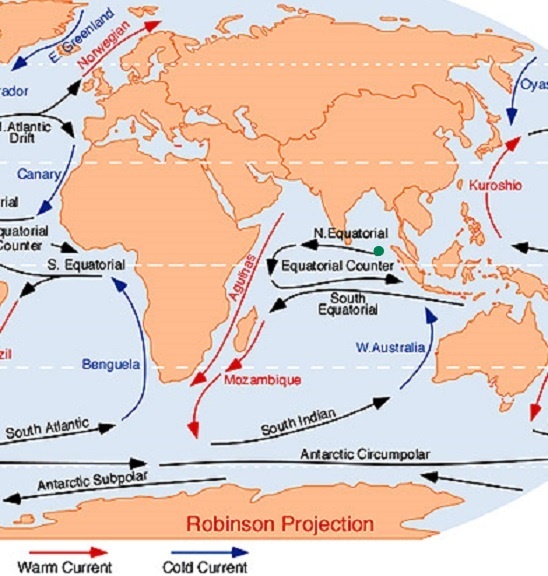 Basing on documented war journals, the wrecked site map and diagram flow of the Indian Ocean currents during the winter months of the Northern Hemisphere, it is not possible that even if the SS Automedon did carry the ill-fated banknotes it could not have floated against the current and into the Straits of Malacca where some of the local population managed to be beneficiaries of the1940 banknotes as told by some numismatic gurus. A more plausible scenario would be when the local treasury was destroyed by bombs some of the banknotes were spirited away by the locals and they coined the crap that it was from the two vessels so that they would not be charged as thieves if caught. What a laugh! 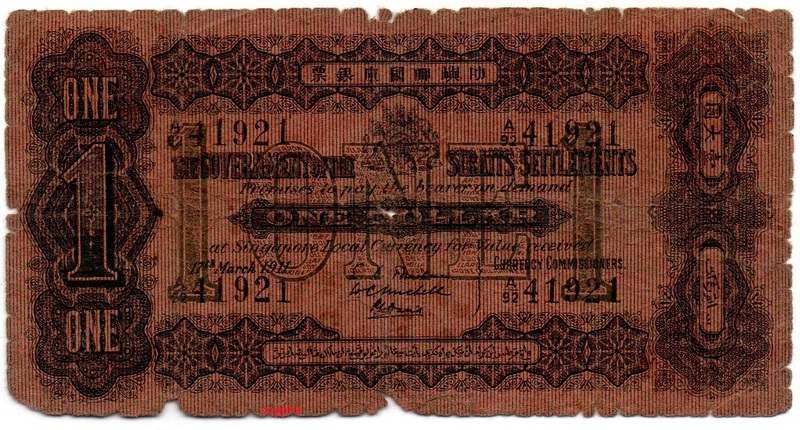 and I supposed our regional numismatist gurus never knew about these documented facts otherwise they would have long disputed the facts that SS Eumanes and Automedon carried the 1940 Malayan banknotes and that some floated into the Straits of Malacca. Well, whatever it is, the fact is that the 1940 Malaya $1 & $5 are very rare indeed but available and they now command astronomical prices if you desire to own one. More importantly, do try to do some research on the particular banknote that you intend to buy and I cannot emphasized more, be very, very careful when you are dealing with the banknote dealers. A rather strange but true episode that happened after the German raider had captured the SS Automedon. As the curtain rises and the fog dissipates into the dawn.........screech!! Hey, am I writing a novel or what? 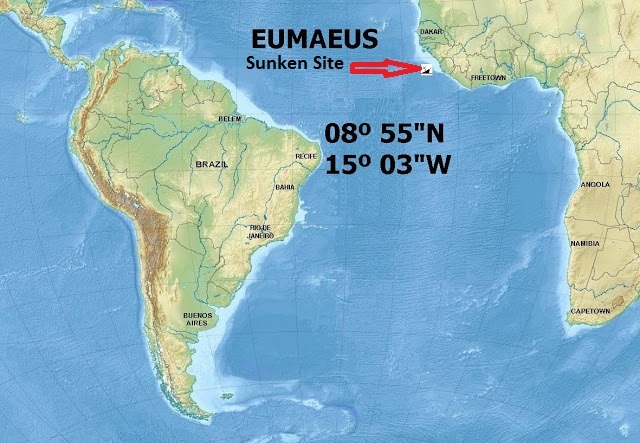 In the process of verifying that the vessel SS Eumanes which was purportedly to be carrying the 500,000 one dollar notes and 100,000 five dollar notes, I noticed that the sinking date was also never published unlike the SS Automedon (scuttled on 11th November 1940). 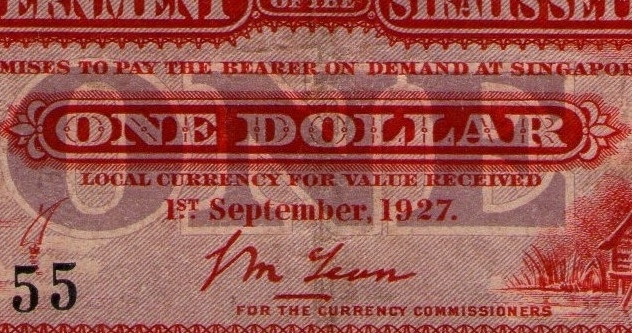 Another renown numismatist Owen Linzmayer published this phrase (TK is this name correct?, referring to the name SS Eumanes) in his The Banknote Book: Malaya 2012 edition. 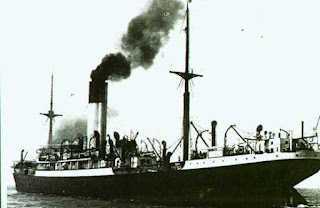 On further researching with leads from Gilbert, a renowned Malaysian numismatist, the closest name from the naval archives of the WWII era was the vessel SS Eumaeus which was torpedoed on 14th January 1941 off the coast of Sierra Leone in the Atlantic Ocean but this troop transport ship was destined for Egypt. 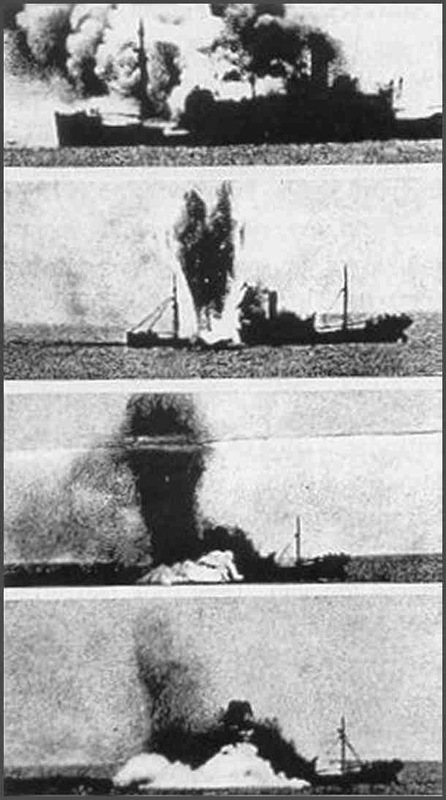 Her master, Captain J. E. Watson ordered maximum revolutions and turned the ship's stern towards the submarine to narrow the target but four shells aimed at the stern and bridge found their mark. Despite being continually machine gunned from a range of 700 yards the Army gunners continued firing until their ammunition was exhausted, scoring at least one hit on the submarine. By this time the SS Eumaeus was well ablaze and as the submarine positioned herself to fire the torpedo which finally sank her she was abandoned. 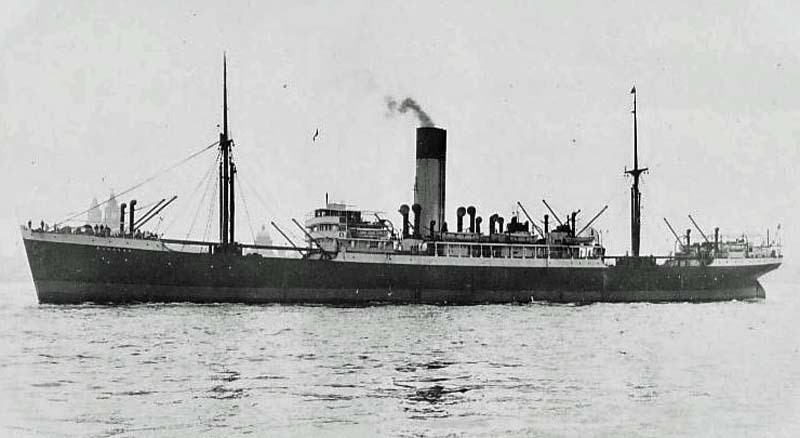 The British passenger/cargo ship Eumaeus was torpedoed and shelled by Italian submarine Comandante Cappellini and sank 118 miles W of Cape Sierra Leone. The records of Lloyds list 23 British fallen and 63 survivors, but the war log of the Cappellini clearly describes a "swarming" of troops getting away from the ship. In fact, this was a troop transport ship directed to Egypt. That is, at least, the version of the Italians. Maybe the Captain wanted to 'look good' ? If it had indeed been carrying troops, they would have been armed and could easily have opened fire on the submarine, even if only to keep the decks clear? Regarding the sinking of SS Eumaeus, it was indeed a troop carrier as my father, Stanley Marcel Guttridge, was one of the survivors spending 12 hours in shark infested waters watching his friends being taken. He only survived because he returned to his bunk to retrieve a picture of my mum (very romantic) and put his jumper on which protected him from the sun as others ended up suffering terrible heatstroke. There is a letter in the Daily Mirror in the 1960’s (I’m not sure my Dad still has the clipping) from a radio operator who first picked up the distress call. Apparently he had been reading a ‘penny dreadful’ and had not shut his radio off at the correct time and although saving numerous lives was reprimanded. I will try and find the clipping and give you more information. Dad is 92 and still going strong. Therefore, it seems that someone sure did a darn good job in coming up with such a cockamamie story line and the whole numismatic world almost swallowed it hook, line and sinker. Hopefully, errors with regards to this episode of "SS Eumanes" that have been made be corrected. the infamous SS Automedon in my next blog. This is even more juicier than "SS Eumanes"! 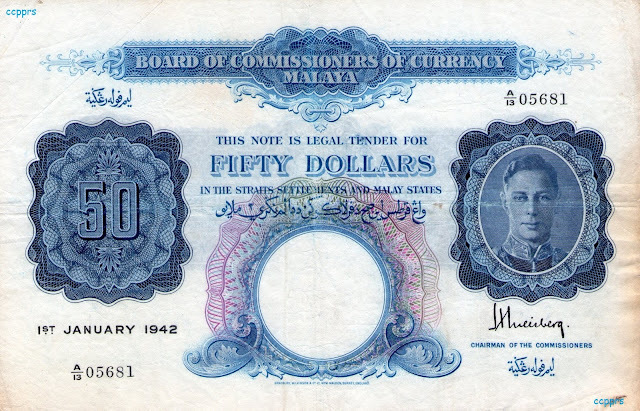 Malaya $1 & $5 Banknotes of the 1940 series, Fact, Fiction or Fabrication? 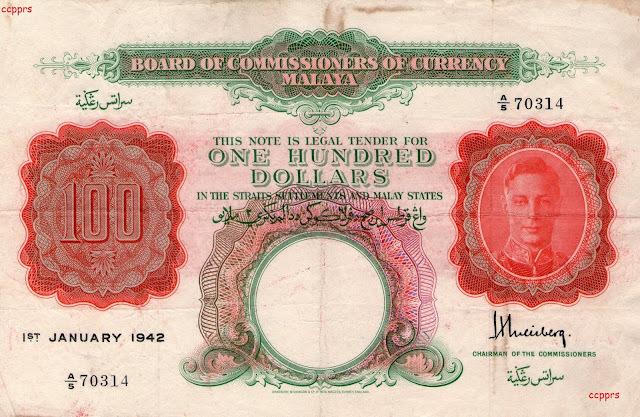 What I am about to write may sound like a mystery novel surrounding the saga of the elusive and very rare Malayan $1 and $5 banknotes of the 1940 series. It all began when I received an email from a renowned Malaysian numismatist and a good friend indeed, Gilbert Chang. 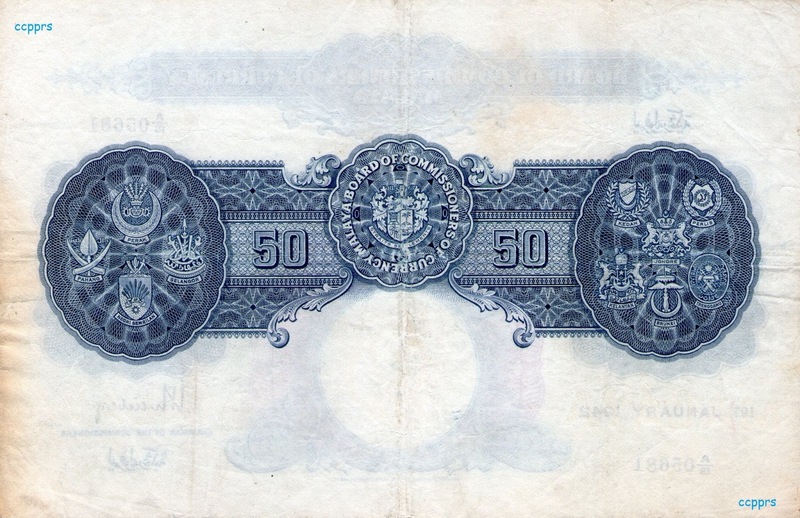 A simple email from him mentioning the names of two vessels purportedly carrying the Malayan 1940 banknotes, was the catalyst that started my quest and his assistance to search for the truth. 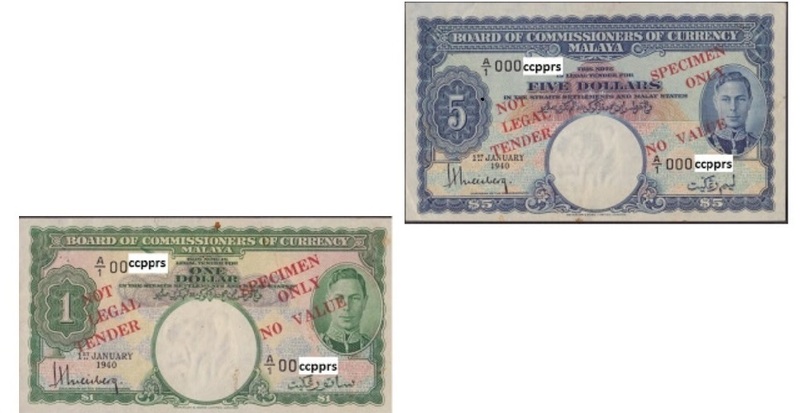 According to published materials from some so called numismatic gurus, 'cut/paste followers' like moi, just swallowed wholesale and followed blindly by reproducing their facts without researching thoroughly to determine the truth and fact, as these 'experts' had already made 'cute' blunders on the names of the Straits Settlements colonial commissioners and financial officers. Base on published materials from these gurus, the following vessels by the name: SS Eumanes and SS Automedon were given the 'honor' of shipping substantial amounts of the Malaya 1940 banknotes from London to Malaya during the Second World War but they never reached their destination because they were sunk by the enemy. 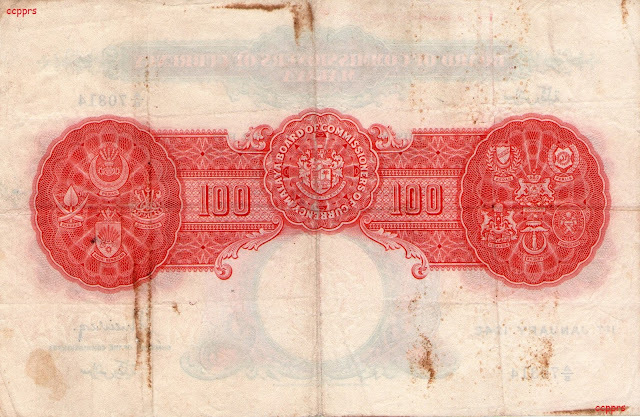 On the contrary, a local dealer said that some notes floated to Malaya and were picked up by the local fishermen. 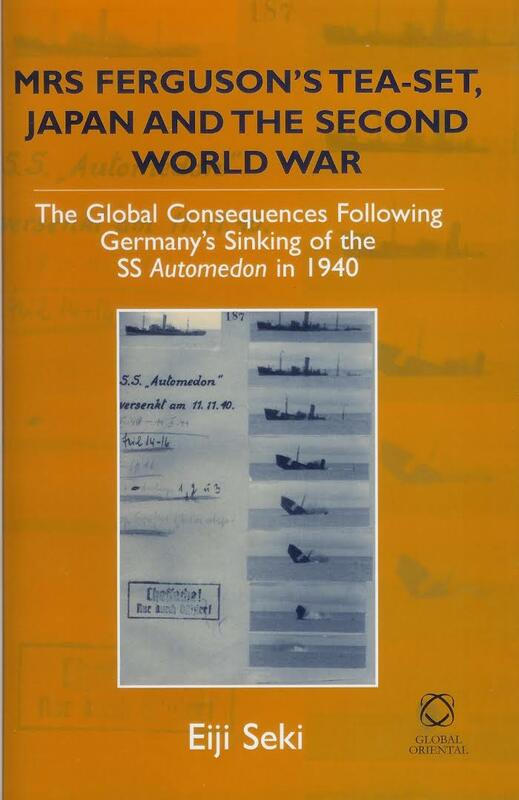 1) The vessel SS Eumanes NEVER existed in any naval records of that era. 2) Base on the reports from the German raider boarding party leader First Lieutenant Ulrich Mohr, the only valuable thing that the SS Automedon carried was an envelope containing TOP SECRET documents about the defence status of the Far East and Singapore plus maybe Mrs Ferguson's tea-set which is another story altogether. I am back!.....................had on purpose wanted to take a short sabbatical (but it became almost 4 years 😢 )from my last article ( Is a name more than just a name.....) to take root, digest and hopefully rectify the MAJOR mistakes made by our friendly up north publishers and also hopefully some assistance and verifications from our senile....oh I mean SENIOR numismatists. Sadly nothing happened, even though I wrote to the publishers and others, the mistakes were still repeated in their latest catalogues although they did acknowledge my emails. A world premier British auction house gave me a short reply when I wrote to them, mentioning that they do not do research on that particular banknote because I am not the consignee of the note! (just asking that you get the facts right!!!) Later on their director sent an acknowledgement of thanks and in their subsequent auction catalogues the currency commissioner's name were not published. It seems that no one gives two hoots about the true facts, everybody wants to make money from the newbies and unaware collectors........even the old established numismatic associations have gone with the wind or taken over by dealers to make money more than to educate the public on historical heritage, etc. Enough said................ but it seems that there are very few of us who believes in educating the newbies, and thanks to a certified Malaysian numismatist and banknote grader, he contacted me a few months ago about my article ( The Problematic Malayan Banknotes of 1940..) to clarify certain facts. Imagine the horror when I discovered that I was no better than the publishers of the catalogues and articles, who just copy and paste so to speak. Ever had anyone called you by a different name or wrote an article about you and used the wrong name!! I supposed someone took a look at the signature and deduced that the person's name should be L.M. Lean by the way he signs his name,............... what do you think? What about this one? It was deduced and published as Luis Shelley. Well, both were close but incorrect and "a miss is as good as a mile"!! 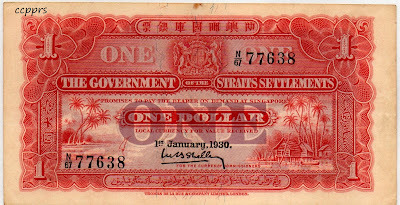 In fact, the person/expert(s) responsible for coining these incorrect names should have done some research from the newspaper archives or relevant Straits Settlements documents in the first place, rather than be looked upon as experts, and unwittingly misinformed a lot of people, publishers, auction houses, etc for some forty or more years. Well, I hope they see this article and refer to Owen Linzmayer and Mike Prizov contributions in The Banknote Book and realized the errors and so correct their catalogs, publications, etc to hopefully re-informed the Straits banknotes collectors and restore rightful ownership of a correct name and acknowledged achievement of a Straits Settlements Officer. These are some newspaper clippings from the 1930s that confirms the correct names of these honourable gentlemen whose names were all these many years spelt wrongly. Well got to give the 'fella' credit! Signature really looks like Rex Curall..............Right?..... WRONG!!!!! The names: L.M. 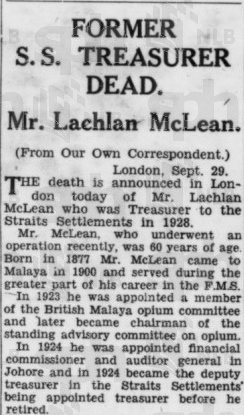 McLean, Luis Shelley and Rex Curall can never be found in any official Straits Settlement documents! 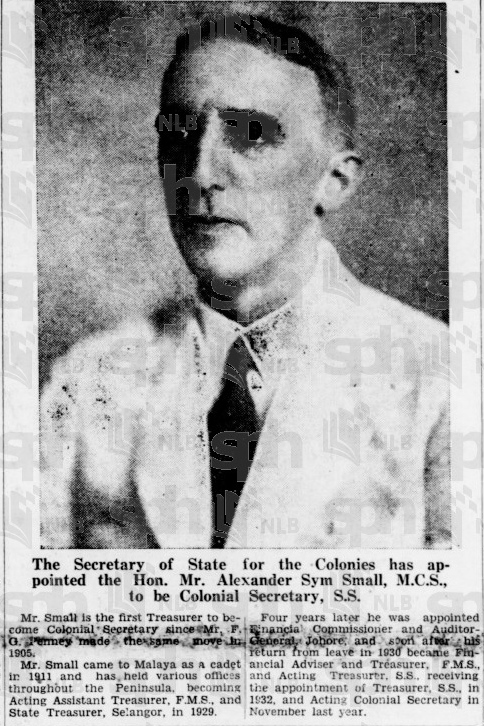 I hope that our esteemed learned banknote experts can concur and correct these glaring mistakes and restore the rightful acknowledgement of Mr Lachlan Lean, Mr Malcolm Bond Shelley and Mr Alexander Sym Small's appointments and invaluable selfless contributions to the government and people of the Straits Settlements era. 1942 $50 & $100.... Best,Worst & Very Good? Why......Why......the WORST.....because this set of Malaya $50 and $100 is graded far better than VERY GOOD.......what? say again? A Case of Numismatic World of Mrs Malapropism! Ha! Ha! WOW! What a GOOD year 2012 has been for me!!
" 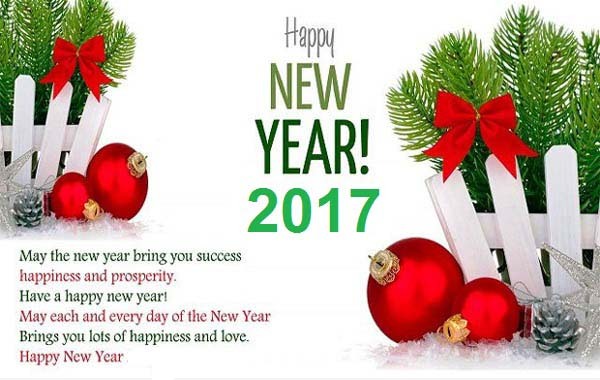 A Happy Blessed and Prosperous 2013"
and that all your hopes and aspirations come true for 2013! What a Blessed and Prosperous 2012 has been for me.......................................it is really GOOD ................despite all the "crabby Euro screw-ups, US fiscal cliff rubbish, end of the world Mayan nonsense, etc................" I've made Good enough in the equity market to buy notes that I wanted, go on GOOD holidays to neighbouring Malaysia thrice, Hong Kong once and had just returned from the United States after fifteen GOOD and enjoyable days, made some contributions into the GOOD and world renowned Owen Linzmayer's documented chapters of The Banknote Book. Ahhhh.............wonder if you have been sharp enough to notice the number of "GOOD" that I have deliberately inserted. Why..........your GOODself may enquire? 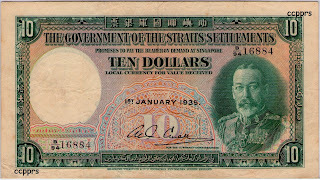 The following 17th March 1911 Straits Settlement $1.00 is defined as a GOOD note! Oh, what a misnomer to categorize this note as GOOD! A well worn and heavily used note. Normal damage from prolonged circulation will include strong multiple folds and creases, stains, pinholes, and/or staple holes, dirt, discoloration, edge tears, center hole, rounded corners and an overall unattractive appearance. No large pieces of the note may be missing. 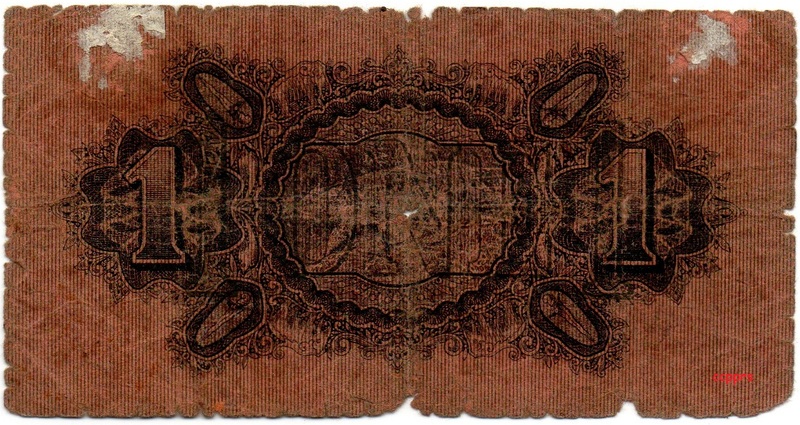 Graffiti is commonly seen on notes in Good condition. 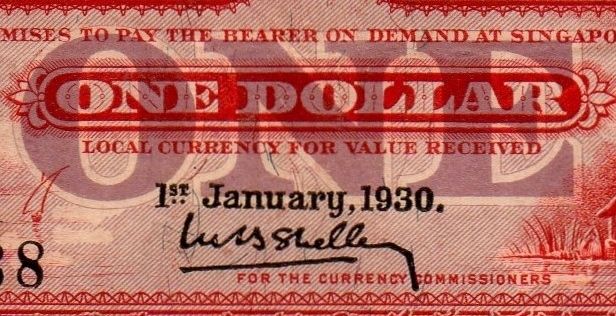 well, did you notice the currency commissioners' signatories of my 1911 $1.00 banknote. Now take a much more closer look............... does any of the signatures bear any resemblance to their names, be it alphabetically or otherwise? 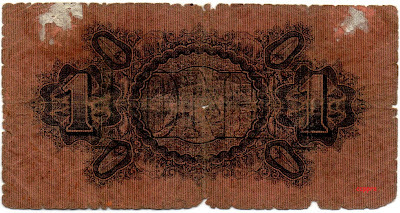 Either my banknote which carries the undocumented signatures of E.L. Brockman, W.C. Mitchell, P.A.F.David a rarity :-) or some so called premier experts made a BIG BOO BOO! !